I recently made a Pineapple Upside Down Cake for a birthday celebration. Secretly I was happy to make it because it meant I wouldn’t have to make frosting to decorate the cake and I could final try a Pineapple Upside Down Cake. Yes, I have never had it before. 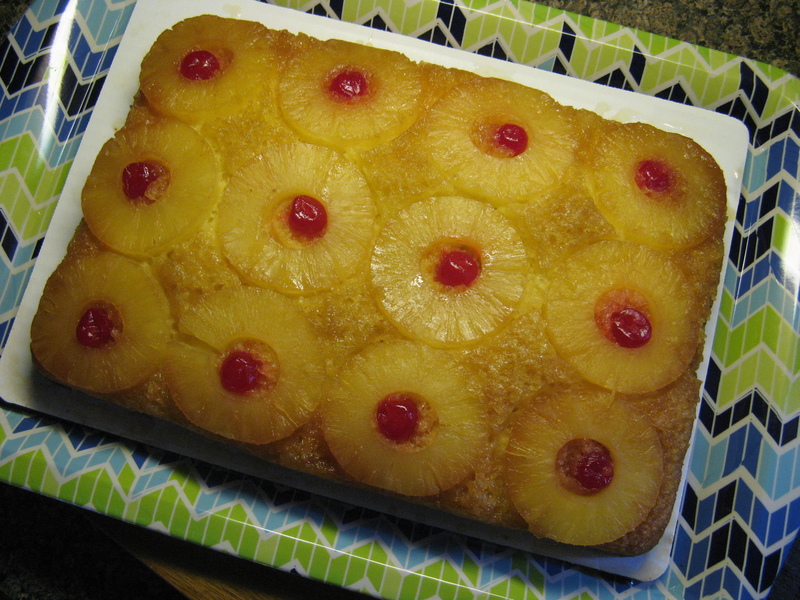 Not really sure why… I like pineapples and obviously I like cake, but, it never crossed my mind to make one. Well, as they say, there’s no time like the present. This cake is super simple to make, especially if you use a box yellow cake mix. After preheating my oven to 350 F, I melted a stick of unsalted butter directly in a 9×13 inch pan in the oven. I checked on the butter every so often to make sure it didn’t burn and also to tilt the pan so the butter wouldn’t melt in one spot. Once the butter had melted I removed the pan from the oven and sprinkled 1 cup of light brown sugar over the butter. Next, I arranged 12 pineapple slices – I used pineapple slices in pineapple juice and I reserved the juice to make the cake – and then place a maraschino cherry inside of each pineapple. Next, I prepared the cake mix per the box directions. The cake mix called for 1 cup of water and I opted to use ½ cup of the reserved pineapple juice and ½ of water. You could also use an entire cup of pineapple juice. Since this was my first time make the cake I didn’t want to go overboard with the pineapple flavor, next time though – yes, there will be a next time for this cake – I will use the entire cup. 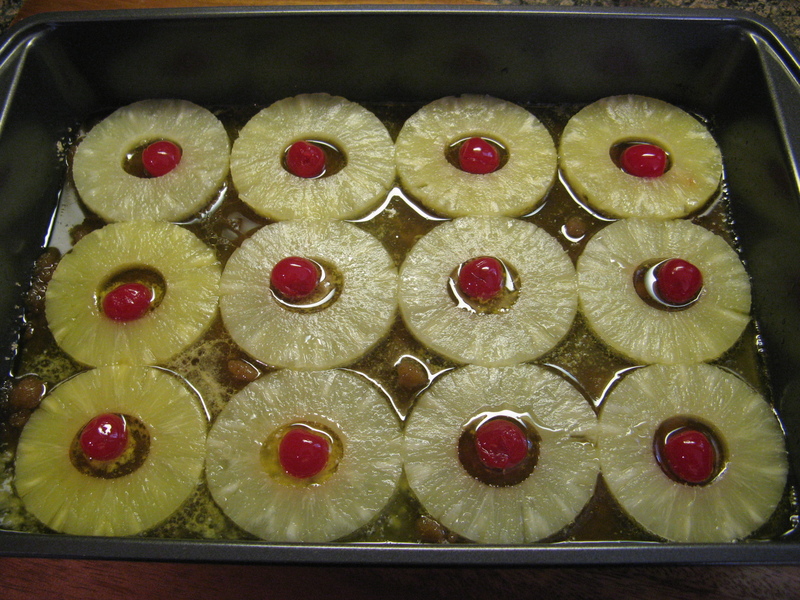 Once the batter was ready I poured it over the pineapples and cherries in my prepared pan. I was concerned that the cake might end up sticking to the sides of the pan, but, once I added the batter to the pan some of the melted butter rose up to the sides so I didn’t have to worry about that. I spread the batter a little to even it out and then baked it for about 40 minutes – until a cake tester inserted in the center of the cake came out clean. I let the cake cool for a few minutes in the pan and then inverted it onto a cake board and platter. I was initially just going to use the cake board, but, was concerned that the syrup that was created by the butter and sugar would spill over so I went with the platter as well. After inverting it, I let the pan rest on the cake for a few minutes to make sure that all of yumminess had dripped down. I easily removed the pan and a few pineapple stuck to the pan, I removed them and placed them on the cake. I can’t wait to make this cake again. It only took about an hour from start to finish and while I was concerned that it would be overly sweet and that the cake would be very thin, the outcome couldn’t have been farther from the truth. The cake was just the right height and was fluffy and light and the sweetness was right on point with the cake, pineapples and light brown sugar. One other thing that’s nice, thanks to the pineapples it’s so easy to cut this cake into 12 equal portions! *I used a 20 oz. can & an 8 oz. can. The 20 oz. can had 10 slices and the 8 oz. had 4. Place the stick of butter in a 9×13 inch pan and place in the oven to melt. This will take a few minutes. Remove the pan from the oven and sprinkle the brown sugar evenly over the butter. Arrange the pineapple slices over the sugar and then place a cherry in the center of each pineapple slice. Set aside. Prepare the cake mix per the box instructions and then pour over the pineapple slices. You can tap the pan down or use a spatula to even out the batter. Place in the oven and bake 35 – 45 minutes, until the cake has browned and pulled away from the sides of the pan. Let the cake cool for a few minutes and then invert on a platter. Let the pan sit on top of the cake for a few additional minutes so all of the syrup can drain out and then remove the pan. If any pineapples or cherries remain on the pain just remove them and place them on the cake.